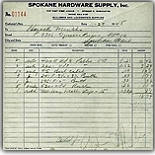 Welcome to Spokane Hardware Supply, Inc.'s website... It is no secret that, since 1945, we have provided great products and excellent customer service the old fashioned way! Continuing this core tradition, we are pleased to now offer a convenient way to preview, research, compare and purchase products online... at your convenience, at The Hardware Hut. It is our company's goal, to continue to provide you with new and unique quality hardware items. I would like to personally invite you to email me with any comments or suggestions that you may have. 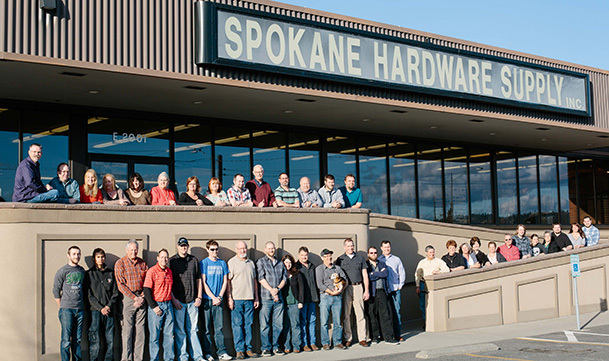 I hope you've enjoyed your visit and return often to see what's new and changing at Spokane Hardware Supply, Inc., The Hardware Hut, and in the world of hardware. It was 3:00pm Sunday afternoon on December 7th of 1941, Pearl Harbor Day, "A day that will live in infamy". We had all heard the crushing news of the Japanese sneak attack on our Naval and Armed Forces in the Pacific early that Sunday morning. Gathered for the usual Sunday dinner at the home of Mr & Mrs Roland L. Northrop, were his very close family; his wife, one son (Orson) and two daughters (Dorothy, Elizebeth) with their spouses. During the grave conversation around the dinner table that day, there was a slight pause and R. L. Northrop stated that he knew that his family would go their separate ways to fight in the various branches of the service. But he felt that when the war was won and they were all back together again, the time would be opportune to form and start their own wholesale hardware company. In his 40 years he had become known as "Mr. Hardware" or the "Dean of Hardware" in the Northwest. He started in 1919 as a clerk at the original Spokane Hardware Company, moving on to work at the old McGowan Brothers Hardware as a clerk and a buyer of builder's hardware. While there, he worked with a young man named Henry J. Kaiser who went on to make quite a name for himself in ship-building and aluminum. He then moved on to the old Holley Mason Hardware which was bought out by Marshall Wells Hardware, which at that time was one of the largest hardware distributors nation wide. He was with the Marshal Wells Company for 37 years as manager and buyer of their builder's hardware department. The war was over and his family had come home, with his dream of the future still foremost in his mind, they founded Spokane Hardware Supply, Inc. in October of 1945. "R.L. ", as he was then affectionately called by all who knew him, was 58 years of age, when most men think of retiring. Under his sage guidance, he taught his son Orson, and two son-in-laws the hardware business and through depressions, nation-wide strikes and two more wars, the company continued to prosper and grow. "R. L." passed away in May of 1956, but he lived to see his "dreams of the future" grow into a vibrant and robust business. He would be pleased to know that his son Orson continued to direct and grow the company with the same core beliefs that he founded the company on. Offering the "Highest Quality Products", the "Best Customer Service", and a "True Commitment" to both trading partners and employees. Orson's son, Stephen James Northrop, is the third generation to be active in the family business, which is entering its 70th year of operation.